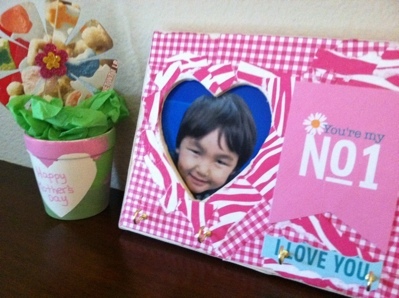 Mother's Day gifts from Leo and Sena. They made them at school. I gave my wife a little present too. Thank you for everything, mom! But probably bigger present from me is that I started getting up at 5 o'clock and making the lunch boxes for Leo, Sena, and me as well as the breakfast everyday. I do laundry sometime too now. So I fall asleep at 10 and sleep well, in fact. Since I need to get up early, I don't drink beer much, which is good too. The goal is to get up at 4, complete preparing lunch and breakfast by 5 and surf for an hour from 5:15-6:15, and come back home at 6:30 and have breakfast with everyone. I am now used to getting up early, so I can even do that tomorrow. Well, I can do anything now for Leo and the family members who support him.